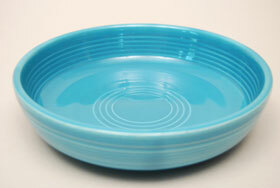 The original Fiesta dessert bowl was initially thought of as a fruit bowl by its maker, designer Frederick Rhead. The outside rings were formed by the mold while the inside rings were then hand jiggered, which we see evidence of with the variation of the inside rings (a special treat is to find five, rather than the normal 4 inside bottom rings). 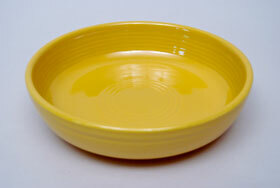 A popular bowl that was part of the original release in 1936, the dessert bowl has the distinction of being the last item discontinued from the line in 1960 before Fiesta was restyled into Ironstone in 1969. 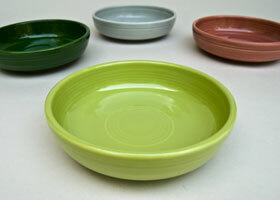 Available in all colors, but exceedingly rare in the Medium Green glaze which was introduced in 1959, less than a year before the dessert bowl would be discontinued. 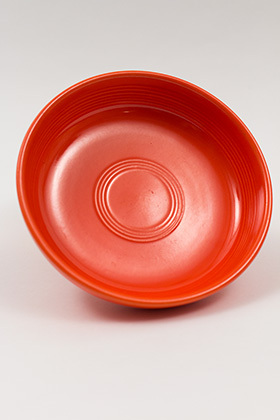 Circa 1936-1951: A simple, yet delightful bowl, made in all eleven Vintage Fiesta colors, the dessert bowl will prove itself useful in many ways on the table. 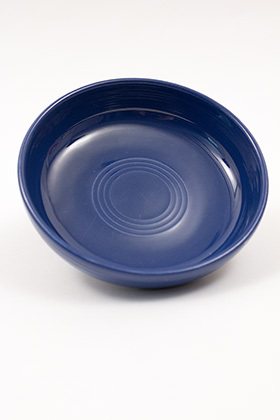 Hard to find in good shape in the original blue Fiesta glaze, this example is in excellent condition, adorned with hand crafted rings and marked in the mold on the bottom: "fiesta MADE IN USA HLCo"
Circa 1937-1959: A popular bowl, produced for the entire length of the original Fiesta line. Measures 6 3/16" w x 1 9/16" tall. 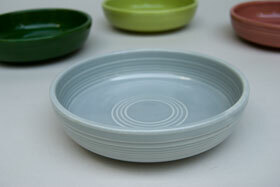 Marked in the mold on the bottom: "fiesta MADE IN USA HLCo"
Circa 1951-1959: Chartreuse Fiesta dessert bowl. Produced for a short time in the 50s colors. This chartreuse example looks unused. 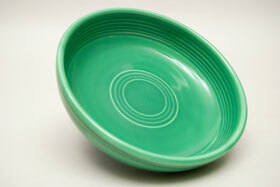 Circa 1951-1959: Forest Green Fiesta dessert bowl. Produced for a short time in the 50s colors. This dark forest green example looks unused. Marked in the mold on the bottom. Circa 1951-1959: Gray Fiesta dessert bowl. Produced for a short time in the 50s colors. Fiesta gray is a subtle, yet complex color that really fills out the 50s pallette. 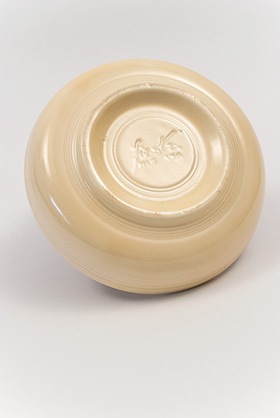 Circa 1951-1959: Rose Fiesta dessert bowl. Produced for a short time in the 50s colors. This rose example looks unused. 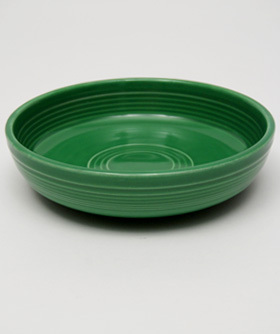 Circa 1959-1960: One of the rarest medium green Fiesta pieces is the humble dessert bowl, produced for less than a year and in far less quanities than earlier pieces. 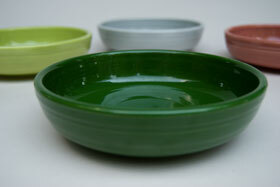 Collectors will delight in finding the dessert bowl in medium green. This example is in excellent condition without damage or use and with a wonderful, even and rich application of the medium green. 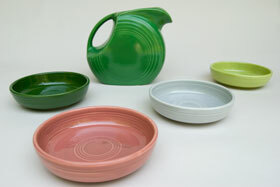 Circa 1936-1951: The Vintage Fiesta dessert bowl in the original green glaze would have been discontinued in late 1951, to make new for a new and modern '50s glaze. Circa 1936-1951: The original Fiesta dessert bowl was initially thought of as a fruit bowl by its maker, designer Frederick Rhead. The outside rings were formed by the mold while the inside was then hand jiggered which we see in the inside ring variation, pattern and depth. Marked in the mold on the bottom: "fiesta MADE IN USA HLCo"
Circa 1936-1943: Discontinued early, the Vintage Fiesta dessert bowl in the original red glaze will prove the hardest to find after Medium Green of course!